In honor of it being Tuesday, I thought I would write a bit about my last night at Teen CBS that we had a few weeks ago. I’ve been involved with Teen for two years and it’s been amazing. Just looking at the faces in these pictures reminds me of all the amazing relationships I’ve built over the years. Three weeks ago we had our sharing night/senior night and got to hear from quite a few seniors about what their time at CBS has meant – and let me tell you just hearing them gave me fule to continue in youth ministry (even though next year I’ll be in eTeen with junior high). One student shared that before this year she never even had a bible. One said teen was what kept her together and gave her a safe place to come each week. Really listening to them encourage the younger students was awesome as well- they totally get it, community,fellowship & God’s Word – THAT is what makes for strong friendships. I pray for each of these seniors as they go off to college next year that they would make amazing christian friends & find a church home! I was meditating on it and it all seemed so simple all of a sudden – to disciple someone, to pass along what you have taught me to someone else. to live my life in a way that shows what you’ve taught me. what that doesn’t mean is I need to go out and memorize the whole bible and learn a lot of new things to disciple someone – NO, it means to teach someone what I’ve been taught. and the best way to learn, I mean really learn, is to teach it to someone else. try it – see what god is teaching you, telling you, and explain it to someone else – teach it to them, and I know that it will help you to really live it too. If I’ve learned anything these past two years is that we don’t have to be fabulous teachers/preachers we just have to have a willing spirit – and God WILL use us! How amazing is that? I’m thankful for the time He’s given me the past two years with all the amazing students and leaders at Teen CBS. I’ll miss you all! 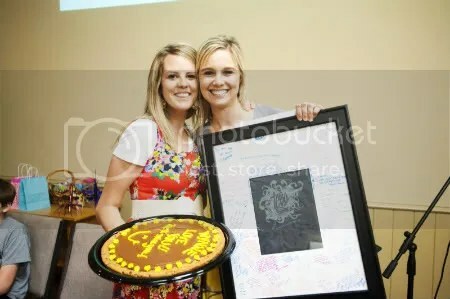 the last night they made me this really special cookie cake, card, and beautiful frame with everyone’s signatures! I will treasure it always!